“Kunzite and Hiddenite are both varieties of the mineral Spodumene. Kunzite carries the pink ray of Divine love and joy, and Hiddenite carries the green ray of Divine healing and gratitude. Hunzite’s a is the emotion of the heart – learning to see the energy of Divine love in every aspect of reality. Hiddenite is the physical aspect of the heart – the expression and experience of gratitude for the wellspring of abundance and healing that is the Universe. Joy and gratitude are inseparable. When one is moved to feel joy over some aspect of one’s life, one inevitably feels gratitude as well; and when the understanding of the gifts of the Universe stirs the feeling of gratitude within one’s heart, it is inevitably followed by joy. The flow of energy created by the emotions of joy and gratitude are similar to a double-helix, the same pattern as our DNA. When we are feeling joy, we are receiving the full energy of Diving Love. When we are experiencing gratitude, we are giving that love back to the Universe. This flow creates an even energy exchange between the Universe and the Physical plane. Though we are but sparks in a vast Universe of stars and consciousness, we are as important to the Divine plan as if its execution depended upon us alone. Many people feel that humanity is a backward and un-lovable species, constantly committing crimes against each other and the world in which we live. This attitude, as well as the acts that precipitate it, have their origins in the concept of separation from the Divine force of the Universe. Kunzite and Hiddenite remind us that when we reconnect with the immeasurable love of the Universe through the emotions of Joy and Gratitude, we see all things as sacred. In renewing our connection to the Divine, we may very well be renewing our chance at the “redemption” off the Human race. Kunzite & Hiddenite have appeared as your Allies to remind you of the power of joy and gratitude in your ife. At the moment in which you experience these emotions, you are experiencing reconnection to the Divine Creator. Gratitude is the recognition of flow between you and the Universe. When you express gratitude for your life and experience, you establish a flwo of energy, giving and receiving between your self and the source of all things. This flow strengthens your sense of connection with all beings. Joy is the recognition of this inner connection. When you sense Joy, you are experiencing the affirmation of the unbreakable bond between the creative force and the creation. While in the state of Joy, you recognize the interconnectedness of all things, and the beauty of the Universe’s love for you. Kunzite & Hiddenite are bringing to you the remembrance of your connection to Source, and the celebration of infinite creation. Be grateful for your lessons, your life, and your creations. Give thanks to the Universe for the opportunity to be a conscious being who is able to learn and grow and change. Celebrate the Joy of being a spark of the Divine’s Light on Earth. Share this joy and thanksgiving with others, and soon the entire Human race will be raised up to a new level of understanding and Love. Today is a master day, 11:22. It is a day of setting clear intentions, using the power of our focused energy to link to our soul’s Divine Plan. Set the intention to welcome Joy and Gratitude into your life. See the connection between these two vital elements in your life. Know that they lead to higher vibration and higher consciousness, opening up portals to new possibility. Know that they are gifts from the Universe and a tribute to the Divine within us all. 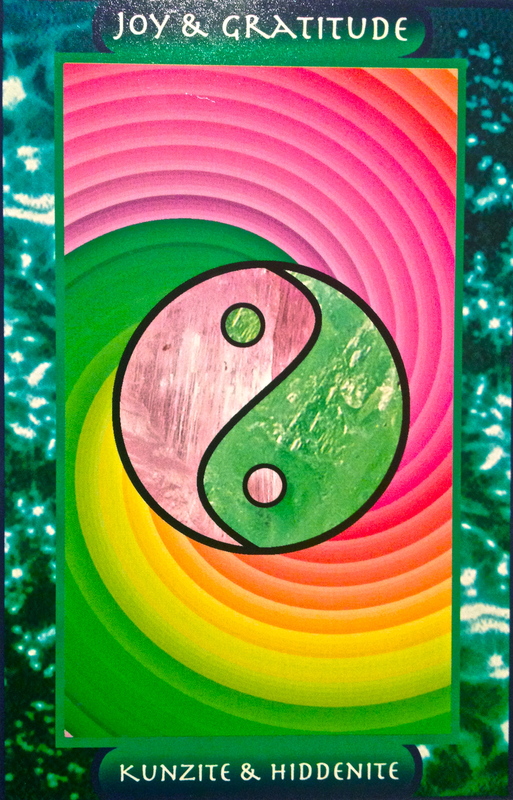 There is a reminder here of balance between the masculine and feminine energies. Honouring these powerful energies within will see them balance outside of us, in our relationships and also in the world around us. This starts in the heart center. It happens when we practice acceptance and unconditional love; when we open ourselves up past our fears and self imposed limitations and explore something deeper and more profound. When we manage to equalize the aspects of giving and receiving love. Whether you have access to Kunzite and Hiddenite or not, you can absorb their high vibrational energy simply by meditating on the image on this card. You need not worry about finding these stones in your local shop, or making the investment unless it is feasible for you to do so. Know that every crystal on the planet, or in the Universe for that matter, will happily lend you it’s healing capabilities if you can just focus your intention and ask it to do so. Then send gratitude as you sit back and soak up the vibes. Bringing joy and more gratitude of course.